today I am guest designing for the second time at Strawberry Jude Stamps and I am just loving these cards that I created! They are so elegant, neutral and clean and simple! 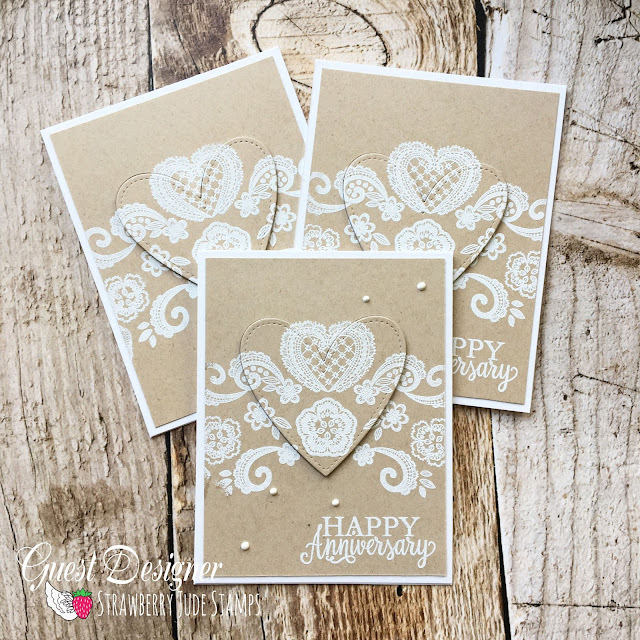 That big lace stamp from the Couple's Sentiments stamp is gorgeous and can be interlocked to create a full page background - how much fun is that!? Sometimes it is the simple, small details that make a card. I was sitting there for a bit wondering where I should take this card and then I die cut the heart and re-attached it and I LOVE IT! I am giving away a MISTI tote today sponsored by Simply Charming Everyday she makes the most amazing Bunkie Bags and MISTI totes to protect your craft supplies and she can even work with you to get the fabric you like (I love Harry Potter stuff!). Thank you for supplying today's giveaway!!! Justine, your video isn't working for me. It says it is unavailable. Is anyone else having difficulty? Another great, and easy card! I love seeing the ideas that I can do without having to invest in so much. I have all my markers in their original packaging yet, waiting for the right idea to hold them. I love the bag for markers and think I better grab one. Thanks for the link to them, I would have never heard of them otherwise! I love the look of white embossing on kraft colored card stock. It is so pretty! I bought a small bunkie bag for my granddaughter awhile ago, Easter print & will fill it with Easter goodies, something different than a basket. It was really pretty & constructed very well. I love the white embossing over the kraft cardstock. Simple and elegant. Your cards are very pretty. I love the look of white embossing on kraft cardstock. Kraft and white...swooning! Gorgeous cards! I just moved into a brand-spanking new house and have an actual craft ROOM (as compared to the kitchen counter, between the fridge and sink I had previously). Right now, complete state of disarray, but I'm so enjoying sorting and arranging! Issue: organizing products...by name, by theme, by collection? Going by company name right now... Thank you for the smiles today! I think it is best to do it according to what you prefer. I do it by company because I need to know which companies because of my blog. If I were just a hobbyist, I would probably organize by theme. I am constantly trying to reorganize my stash. I think the clear stamps are the worst. I have a hard time with paper scraps. Not just storing them but using them. Once a year in the spring I go through my scraps and throw them out. I hate it but I have no idea what to do with them. I love that Happy Anniversary stamp. I think I need to organize my paper storage more. Pretty cards! I love the stamp you used, and the white on kraft! My whole room needs organizing! But I think a better way to keep my dies is the #1 priority. I have some bins that I really like, but have trouble figuring how to organize... by brand or by theme! I love the white embossing on the craft cardstock it looks gorgeous. Beautiful and elegant cards, love white on Kraft! My mini cubes of various brands of inks are in need of organization. Right now everything needs organizing, I started to do an overhaul of my craft room and got 1/2 way through and haven't finished!!! But usually it is putting labels and packaging my new stamps and dies that I am always so behind in! I really enjoyed your video and I love the Strawberry Jude lacy stamp you used, its has a very elegant and romantic feel to it. What a pretty card & that lace stamp is amazing! So detailed. Thanks for another great card & video. What a beautiful set of cards. so simple and elegant. Beautiful card. Love the technique. What a beautiful, simple technique. I love the white on craft look. I so much love lace stamps, they make stunning cards like yours ! Elegant and quickly​ done, that's a great match ! I would say my desk needs sone organizing right now...I recently took over our spare room and I'm having so troubles getting it to work for me . So pretty. I recently organized my flowers and ribbons. I think my embossing powders and stencils could use some organization. Adorable stamped card. Love what you did. My least organized area that drives me crazy is my scrap paper. I can't throw any away. I love the cards. The area that needs to be most organized is probably my water colour markers, inks and pencils, they are everywhere. Beautiful cards Justine! The area that I need help with is total organization. I don't have a craft room, so I am using a very small area in my living room. My supplies are in three different rooms. So any organization help would be great! Simple, yet elegant! Love them! Love the simple elegance this embossing and stamp creates. My desk and stamps need organizing. Love the cards! HMMM what area needs organization the most would have to be my counter top where my cricut and printers sit and also everything else I don't know what to do with yet or don't have the time to deal with. Adorable card! Currently my craft room is my kitchen table. So I would say every where!! My crafty items: scissors, tweezers, glues, adhesives, etc always need to be within reach, but I can't seem to get them under control! Any suggestions? My ribbon and twine collection is in desperate need of organization! The cards are so pretty amd really very simple to re-create! Hi Justine, Love the white on craft card stock, and die cutting the heart and popping it up is lovely, great card, TFS. Cheers Anna. That's a cool technique thanks for sharing. Wonderful, simple but beautiful anniversary card. I find them hard to make--don't want them too cutesy. This on is so elegant. The popped up portion adds just the right amount of dimension and interest. Takes it out of the ordinary... Thank you for the introduction to Simply Charming Everyday! Very beautiful cards. I always love the look of a panel partially diecut and popped up. I love everything lace, so to see this stamp set was exciting! That white on the craft paper is just striking! When you went to cut the heart out of the middle I just about screamed no, but oh my what a dramatic affect! You are very good at your craft! Thank you for sharing it with us. Beautiful cards. My crafty stash needs a major overhaul. Right now I have crafty stuff all over the place but I still manage to get stuff done. That is a lovely heart embossed card. I need more room for my crafty needs. I really like the white embossing on kraft cardstock. I love your cards,and the MISTI makes it look so easy. Thank you for sharing! Love the white on kraft look! I would say that my paper is the area that needs the most organization! I wish I could afford a bunch of the nice cubbies and the acrylic paper racks to put in them. Then my craft room organization would be almost done! These are lovely! I love lacy things! Beautiful cards! Love the white on kraft paper! I think my paper stash needs the most organization! I think every area of my crafting needs organization! I think I have a good system, until I run out of space... and then it's chaos trying to re-organize everything back. Wow! Such romantic cards!!! Love them!!! My embellishment organization, or lack of, needs a lot of help! What needs organization most in my craft room is my desk. I am an organizational fanatic (some may say) but I love it! However, the desk is always in disarray during a project. I try to clean it after each card to be ready to go for the next time. This is where I sometimes fall short...Eeeewww. 'Nuff said! My actual work space always needs organizing. It is fairly large so becomes a catch all. It's an effort to keep things in its place. A wonderful card1 Love the soft colors & elegant simplicity! The area I need to organize the most in my craft room is patterned paper. I have some gorgeous paper & have a hard time cutting it up so have paper everywhere. My stamps need organizing. I don't have much space so everything needs organizing. LOL!!! I had never heard of this stamp company but will have to visit their site. I guess I would say my inks. Does the whole room count? I need the most help with traveling then returning and putting things back where it belongs. Wish I had two of everything I can dream. Love the kraft and white together. Gorgeous card. My ribbon stash needs the most organizing - it actually should probably be put away, because I hardly use them now! Right now, probably my dies. They are collecting in a drawer and a box, and a few other places right now! Yikes! I do have the storage, just need to finish getting them all put away and categorized. such a great card - love the white popping off. Beautiful! Love the white on kraft! Gorgeous effect! These cards are so beautiful. I love embossing. I have been working on organizing my WHOLE craft room this week because I moved into the room that was originally used for the grand kids to sleep over. Now the room is all for ME-- all for my craft stuff. I am in Heaven but it is a big project and getting organized takes a lot more time and effort than I thought. I love the white on Kraft....gorgeous and simply elegant as well! My stamps need to be organized, but I have started working in that direction. love the white on kraft color combo! My whole craft area needs organization. I'm in the process of moving the whole space up from the basement to the second floor. The only thing that is actually organized at the moment are my copic markers as Ijust bought a storage rack for them. I love this simple but elegant card. I have 3 friends with anniversaries this month. Thanks for the great inspiration!! !